Does anyone know anything or have a date for this group picture of soldiers. This photo dates from the late 1870's I suspect. The uniforms are from that time, and I would suggest that the photo is of a group of volunteer soldiers, part of the middle Victorian craze for soldiering which started in 1859. 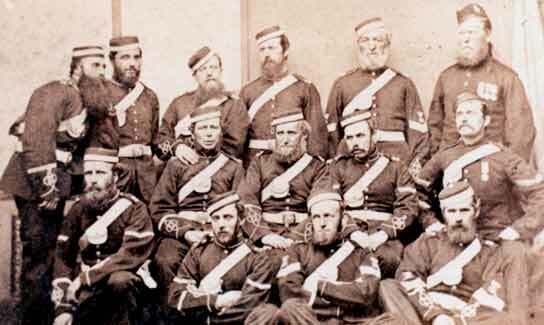 The older gentlemen - top right - may be a veteran of the Crimean war, as he has a "Glengarry" bonnet, introduced to Kilted regiments in the 1850's and row of medals. I have a photo of a Great Great Grandfather of mine who served with the 93rd Sutherland Regiment in the Crimea. It was taken in the late 1870's and looks similar to this group, and he has a similar row of medals (now in Stirling Castle). I wonder if it is 'Meiserie' Hossack, mentioned by Bobby Hogg in photo 480?